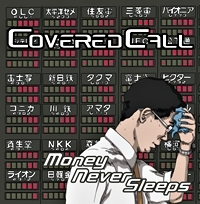 With an artwork reminding me of the stock exchange and with the title 'Money Never Sleeps' the band releases a current album. Several of this band's musicians also work in the tumultuous stock market, hence the name, Covered Call (an investors term referring to having a long position in an asset combined with a short position in a call option on the same underlying asset). I don't know if they lost a lot of money, but they don't have to worry about getting rich in the music business. The hardrock this Swedish deliver is very catchy and easy to listen to. You immediately get a kind of recognition. The band certainly know how to write good songs. They mix influences of Bon Jovi, Van Halen (just listen to the song "Nothing At All" and "Let's Make It Real"), White Lion, Journey and Kiss into something of their own. Thomas Vikström has a very good voice, very clear and with enough volume to be called one of the better ones. 'Money Never Sleeps' has a fine production and carries you through some rockers and easy listening songs, sometimes with piano, then again rocking like a hurricane. Fans of good Hardrock/AOR who dig Van Halen, Journey, Thin Lizzy, Kiss and so on, should spend some of their hard earned money by buying this. No bad songs on this record.